I had the privilege this past weekend of going over into Oklahoma and performing the wedding for my niece. It was truly a beautiful wedding because she had prayed for that day for a long time. It was an outdoor wedding on her family’s property. It was one of the neatest weddings I have had the opportunity to officiate. Jenna and Matthew live and work in Amarillo, but she wanted this day to be special and it truly was. Oh, there were things that happened that wouldn’t happen inside a church or even in a backyard. When I was looking where I was going to stand just in front of the arch, it was marked with a cow patty!! Can’t say I’ve ever had that before! They brought the grandparents down to the site in a golf cart. I might add that if all golf carts looked like that I would probably try to golf! The music was non-traditional. Much of it was with stringed instruments but they left to “Signed, Sealed, Delivered, I’m Yours.” I will have to say that Jenna is truly a ‘one of a kind’ young lady. 9 Two are better than one because they have a good return for their labor. 10 For if either of them falls, the one will lift up his companion. But woe to the one who falls when there is not another to lift him up. 11 Furthermore, if two lie down together they keep warm, but how can one be warm alone? 12 And if one can overpower him who is alone, two can resist him. 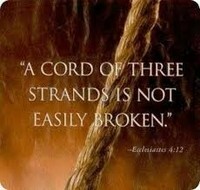 A cord of three strands is not quickly torn apart. She wanted the emphasis on the ‘cord of three strands’ and that cord would be God, Matthew and her. Her heart is truly so sweet that when she asked for that I told her I would definitely work it in. Just before the vows I shared the Scripture and that only by them walking together with God could they truly be that cord of three strands. After the vows and the rings, they went off to the side where a wooden background was with three strands hanging down. They then proceeded to weave those strands together making one cord. It truly brought the whole concept together and expressed the desire of these two as they embarked on the rest of their lives together. The cord of three strands each represented a part of their desire in the marriage. The gold strand represented the divinity of God, the covenant relationship initiated by Him and that will be built under His authority and intended to glorify Him. The purple strand represented the groom a new creation in Christ. As the husband loves his wife and submits himself to the Lord, the Lord in turn will demonstrate His great love in the marriage. The white strand represented the bride. Have been cleansed by salvation in Christ, the purity of the Bride is represented in white. As the wife honors her husband and submits herself to the Lord, the Lord in turn will nurture and strengthen the marriage relationship. As they walked away from that cord of three strands, it gave me a sense of peace as I pronounced them husband and wife. Yes, they will have trials along the way, but with God in the center of that cord in their marriage, they will overcome. That is my prayer for them. 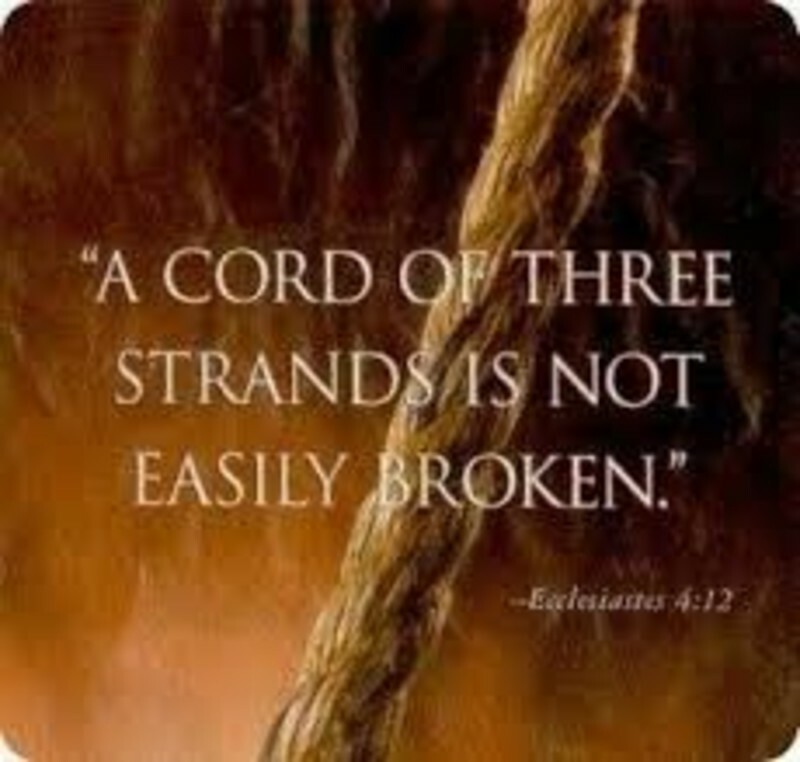 As I consider that cord of three strands, I think of that eternal cord of three strands – The Father, Son and Holy Spirit. In eternity past, they were together and for all eternity they will remain. I am so thankful that this union will never be broken and we can hold to this eternal cord as we walk through each day.